Finish high school and become a driver. This was Nguyễn Văn Chung’s dream. Chung was born into a poor family, the smallest of six children, in rural Thường Tín District, south of Ha Noi, 33 years ago. The American War was long over, and his life was the same as other children in rural areas, a lot of hard work, and simple aims, like becoming a driver. He was close to his achieving his dream, studying in the ninth grade, and doing manual work like carrying wood or transporting beer in the night to meet his tuition expenses. Then, in an instant, all his dreams and hopes were dashed in very cruel fashion. He remembers that day very clearly. As he neared the pump, it sucked him in and cut off both his legs. “I thought should have died. It felt it was unfortunate that my life was saved. His mother’s love kept him going through these dark moments. “It is the thought of my mother during the saddest and the most discouraging moments that motivated me and developed a strong will and determination within. Not wanting his mother to feel sad and cry all the time, Chung decided that he would overcome his plight. He started to learn how to stand up and move around the house by using his hands as his legs, and later, by using two plastic chairs. He fell many times and hurt himself, but he allowed nothing to crush his spirit. After six months, Chung was able to move on his own, and as soon as he could do that, he thought about learning how to swim. Legs are very important for swimming and other water sports, because they both propel the body and keep it balanced. What Chung wanted to do was very difficult, but he had been a good swimmer before, and he relearnt very quickly. The very same year, Việt Nam hosted both the SEA Games and the Paragames. Chung enrolled and was selected as a member of the nation’s swimming team. At the end of the year, in the Paragames, Chung won two silver medals with an award of VNĐ15 million (US$660), which he used to repair the house for his mother. Now, he has been a member of the national swimming team for 15 years. He has won one gold medal in Thailand, two bronzes in Malaysia and Indonesia, and has lost count of the number of medals he’s won in national competitions. After his success in sport, Chung decided to take another big risk: enter the business world with a start-up that would prioritise three criteria: cleanliness, safe for health and environmentally friendly. Two years ago, he’d learnt about handmade soap from a friend who also taught him how to make it totally from natural ingredients. Double or treble, he did not give up. The process of making a SIM soap, Chung’s handmade product – involves many steps. “First I purchase soap base from the Biotech Pharmaceutical co-operative where my friend works, and then get other natural ingredients like honey, pollen, turmeric powder, citronella powder and rice bran. The base is cut into smaller pieces and cooked in a bain-marie until it melts. Since it only uses natural ingredients and uses no chemical, Chung’s SIM soap is healthy for users. For instance, rice bran helps freshen and eradicate dead skin and cinnamon warms up the body and prevents skin from drying in winter. Even for the aroma, Chung uses natural attar that is safe for health. 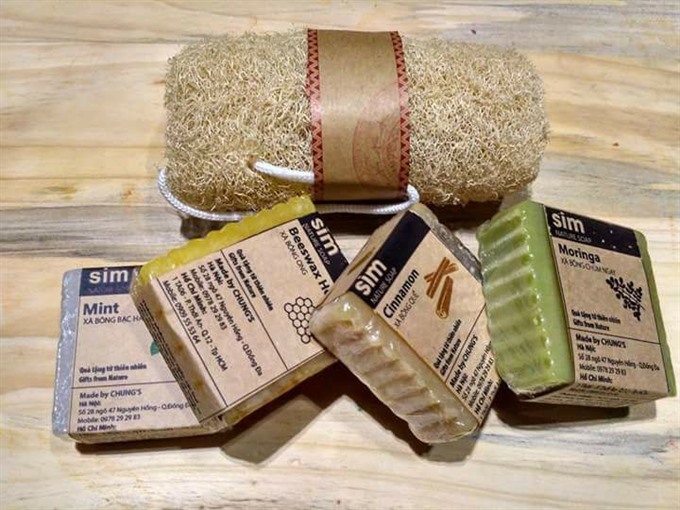 The first SIM soap bars have been introduced to customers via the Green Market held every weekend in HCM City and received much positive feedback from users. 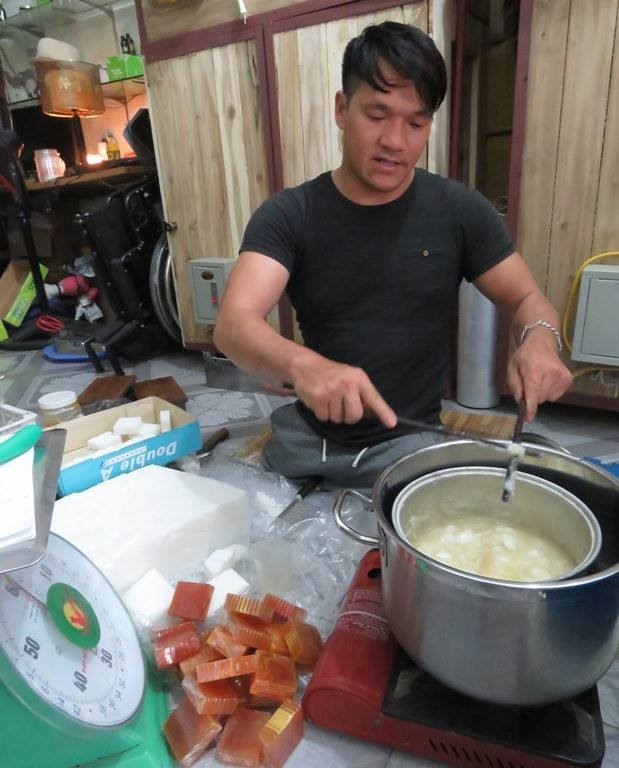 Vũ Kim Anh, a member of the Green Market organising board, said Chung’s soap had been tested before it was accepted for sale. The only drawback of the product is that it is not foamy. “However, I think it is better to create a soap with less foam, but keep it safe for health. Furthermore, it is eco-friendly, unlike other kinds of soap in the market.